Belize's Catholics welcomed the 2nd Garifuna Bishop of Belize, the Most reverend Lawrence Sydney Nicasio. He was ordained at the St. John's college gymnasium on Saturday morning, May 13. Archbishop Leon Kalenga, the papal Nuncio to el Salvador led the mass with six other bishops. Bishop Nicasio received the ring, miter and pastoral staff of his office from Arch Bishop Kalenga. 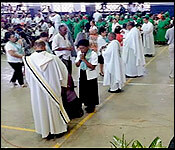 The gym was packed to capacity by delegations from all the catholic parishes in the country, the largest delegations came from Orange Walk where Bishop Nicasio had served as the parish priest of La Inmaculada parish for 13 years, and from Dangriga. Deputy prime Minsiter Patrick Faber and Opposition leader Hon. John Briceno were among the guests in the congregation, as well as Minister Hon. Frank Mena, and the U.S. Embassy's Charge de Affaires Adrienne Kalanek. Bishop Nicasio was appointed Bishop of Belize six months ago when Bishop Rev. Dorick Wright resigned his office due to failing eyesight and poor health. Bishop Wright also attended the mass in a wheelchair, and gave Bishop Nicasio his blessing. I remember when I was a little boy growing up in Dangriga in the 60s my late mother Josephine Sampson used to take me to go and visit her cousin, the mother of our new Bishop Lawrence Nicasio, “Auntie Jane Lewis-Nicasio”, the daughter of “Granny C”. During those days we were all attending Sacred Heart Primary School. Out of all of my aunt’s children, “Lawry” as we all know him, used to stay home a lot, was quiet and always smiling. His older brother Nelson Nicasio was my closer relative and friend and he, Henry Martinez and myself used to hang out regularly. I was a classmate of the new bishop at Sacred Heart Primary School along with Marva Lewis, Dorina Mendez, Gilbert Lambey, Justo Flores, the late Francis Bermudez, the late Sidney Mejia Jr. and several other students that I cannot recall at this moment. Our teacher was the late Mrs Rita Palacio when we graduated that year. In class the bishop kept that smile on his face, was always happy and I have never seen him angry in my life. He was made for the profession he chose and I always wondered what will Lawry be when he grows up? I left Dangriga in 1971 while the bishop was attending Ecumenical High School and lost track of him until when he came to Belize City to attend Saint John’s College while I was a police officer. Shortly thereafter, I was transferred to be stationed in Orange Walk District. In 1978 I migrated to the United States and did not get to see him for a long time. Years later his brother Nelson visited New York City and he informed me that the bishop was studying to become a Catholic priest. I was not surprised when his brother relayed that information to me. He was later ordained in 1989 by his relative Bishop Martin. Some years ago I did a fundraising to donate a set of football uniforms to Sacred Heart Primary School, our alma mater. Most of the former students that were in my class contributed to the effort. When I arrived at the airport with the uniforms, the Customs Department there told me that I had to pay customs duty and sales tax to bring them into the country. I left the uniforms there and I went to the city to look for my classmate Father Lawry Nicasio for assistance. He was stationed at Saint Ignatius Parish at the time but was also administering Saint Martin De Pores in the Lake Independence area due to the illness of a priest. I told him about the problem I was having and we went back to the airport. With his help and the ministry of finance, we were able to resolve the problem and send the uniforms to Dangriga that day. The uniforms were later presented to the children of Sacred Heart School and they were extremely happy for the donation. From this sad experience, I came to the conclusion that our government should allow all donations to the schools in Belize tax and duty free to help our children who are in need. According to the church records, Father Lawrence Nicasio, who has now been promoted to be the next Bishop of Belize, has been serving with distinction at all his church assignments. He spent most of his time in Orange Walk District, a total of about 14 years. He is one of the priests that is totally committed to his parishes and people, well liked and is always available when he is needed. For my family and other families in Dangriga, we can and have always depended on him for our christenings, weddings and funerals and he will go out of his way to be at those services. Two years ago I called on him for my brother’s funeral and he drove all the way from Corozal, after officiating the funeral of Mrs Nogera, to be in Dangriga with my family and myself. When the Garifuna people in Los Angeles and New York City call on him for their annual Garifuna mass he comes as well. The bishopric that is being bestowed on Father Lawrence Nicasio is well deserved in my opinion. The church looked at who were the people that were available to choose from and they selected him. There is nothing anybody can do about his nomination as our next bishop. This is a decision Pope Francis and the Catholic Diocese and people in our beloved country of Belize will never regret. I appeal to my fellow Belizeans not to look at him as a “Garifuna bishop” but as a “bishop for all the people”. Bishop Nicasio knows he is a Garifuna and does not have to be told who he is. We must never forget that we are all God’s children, who are seen as one in his eyes, so let us live according to his teachings and practice our faith in this manner. I wish my relative and friend Bishop Lawrence Nicasio the best in his new post. I am more than confident that he will make all of us proud of him as he continues to serve us with distinction.